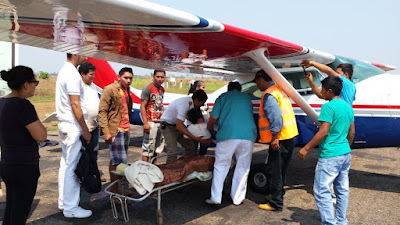 It has been several months since I last updated; here is what has been happening with Bolivia Mission Aviation since then. My family and I travelled to the U.S. for a two month visit in June. We left Santa Cruz in the early morning hours headed for Miami. It would be Saray’s and Miah’s first time in the states. 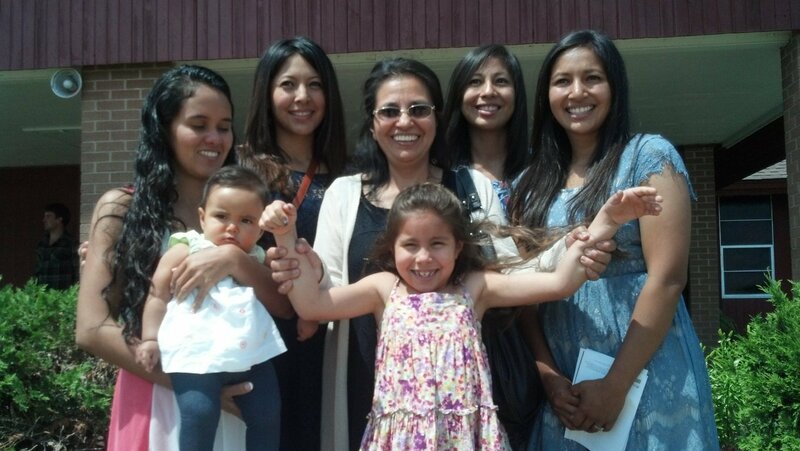 Miah was born abroad as a U.S citizen, but my wife went through a long process to get a U.S. residency visa. Upon arrival in Miami, we had to clear immigration for her final approval into the states. After a short wait, and some questioning, she got the green light. We praise the Lord for blessing us during this lengthy process and the funding required for the various steps. We then headed for Berrien Springs, Michigan, where my parents reside. I had fun showing my wife and baby the many differences of how I had grown up. Up until then they had only heard the stories, and everyday there where new experiences to be had. One example of our new found problems were with car seats. Miah growing up in Bolivia was not required to be in a car seat. 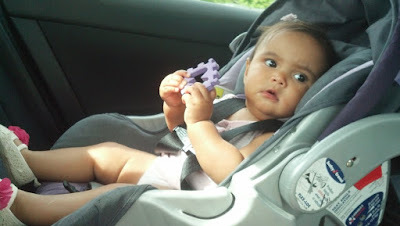 Being eight months old and starting to move around, the idea of being stuck in car seat sent spasms of rebellion! Miah also breast feeds, making matters worse on the long road trips we took. Eventually she would win out, as we kept an eye out for the police and anyone that might want to report us to child services. A couple weeks later, we drove out to Wisconsin for my little sisters wedding. We had timed our trip just right for this special event, and special it was! Saray and the baby got to meet all of my immediate family all in one spot! You can only imagine my joy to be there after so long and seeing everyone welcome Saray and baby Miah into the family. The wedding was truly blessed, as my sister married a dairy farmer on his farm on a beautiful June evening. The wedding was held in a wooded area of their farm with hay bales for pews! Afterwards the wedding party rode out on ATV’S to where the reception was held. We returned home and prepared for our next trip! A week later we were on the road headed for San Antonio, Texas and the General Conference session. We made a short stop at headquarters in Collegedale TN and then continued on. 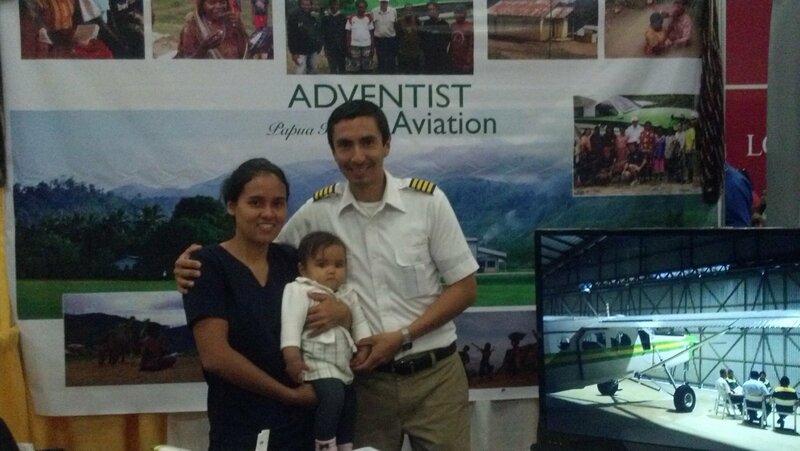 Once at the GC, we helped man the booth for Papua New Guinea Adventist Aviation. I also got to share with people what I did in Bolivia as a pilot and my wife shared what she did as director of the health clinic. The place was so full of people that it was hard seeing someone more than once! We visited Sea World, the Alamo, and other sites around San Antonio before leaving the GC. Our next stop was the Gospel Ministries International missionary retreat held right after the GC near Keene, TX. It was a break to catch up, relax, and spend time with family. We heard lectures, testimonies, and shared what we were doing in the mission field during this week long retreat. David Gates dedicated baby Miah to the Lord on Sabbath morning for church. 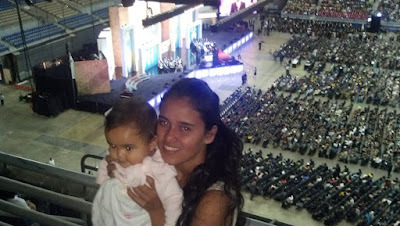 We were truly blessed that my mother who has given so much for us to be missionaries, was present to witness the event. We drove back home and had 3 days to prepare for our next trip, this time flying out to California to see my oldest sisters’s family. We spent time in the hills of Loma Linda, at the San Diego Zoo, Water Park and beach. Visited relatives and celebrated my niece’s birthday. All of this was great family bonding time as our trip back to Bolivia was now fast approaching. We flew back to Michigan for a few more days. Before we left my wife wanted to see the Historic Adventist Village in Battle Creek, Michigan. My little sister joined as we toured the first Adventist church, Ellen White’s Home; where she wrote the Great Controversy, and her and family’s burial site. It was encouraging to see where our founders had come from and what they believed in is still burning in our hearts, to carry on and finish the work. Returning to Bolivia we were ready to begin our work again. It was refreshing to be in the states, but at the same time we got to see why we needed to keep pressing forward with the work here. I had not even arrived in Bolivia yet, and I already had flights to make. Praise the Lord! Since mid April, we have begun to use our hanger and runway full time. All of our airplanes are now under one roof right in front of my house in the hanger we built over a year ago. Steve flew in the Mooney that was in Guyana for several months a few days after my arrival. What a blessing it is to operate from our own runway! This is a huge step forward in the growth of the program, while allowing for more efficient maintenance and flight operations. 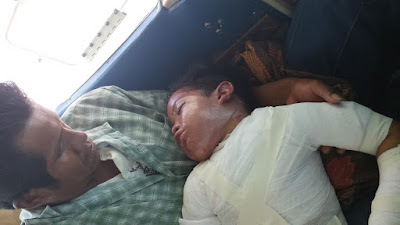 I also made an ambulance flight for a child that was severely burned when a hot water pot spilled on him. I was thankful to have the airplanes flying to do this, as our main reason for being here is to do these types of flights. He and his family are now in the children’s hospital in Santa Cruz, as he is undergoing skin grafts. A few days later Steve and I got to do something we had never done before in Bolivia. Fly our airplanes in formation. The opportunity arose when two airplanes were needed to move missionaries to the same place on the same day. We flew out of our runway one after the other and met up in route. Flying side by side we were able to hone in our formations skills and take pictures and video. 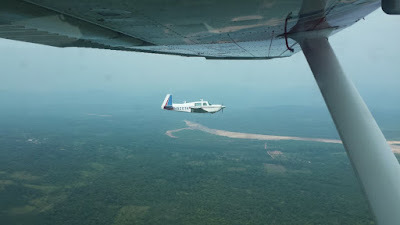 We had the opportunity to fly the same passengers a couple days later and again we flew formation. After dropping them off, Steve flew to Cochabamba to pick up DJ Knott, while I flew back to Santa Cruz. Steve and DJ did some survey flights of high elevation regions where both DJ and us want to expand the medical aviation work. They brought back word and pictures of what they had seen. Very much like the two spies sent out by Joshua. We need to do more of these flights as we prepare to someday soon meet the demands of this high altitude environment. The first airport we want to land in is 13,000 feet high, higher than most small airplanes like to fly. Our small airplane is turbocharged, allowing it to take-off from high altitude airports and climb much higher than normal. DJ also came to Santa Cruz to help get our third airplane going, our normally aspirated Cessna 182. This is our low land jungle airplane, and it needed bigger tires to operate safely. DJ and Steve put in time installing these tires. The end result is a much more capable airplane. We would also like to do the same to the turbocharged airplane. 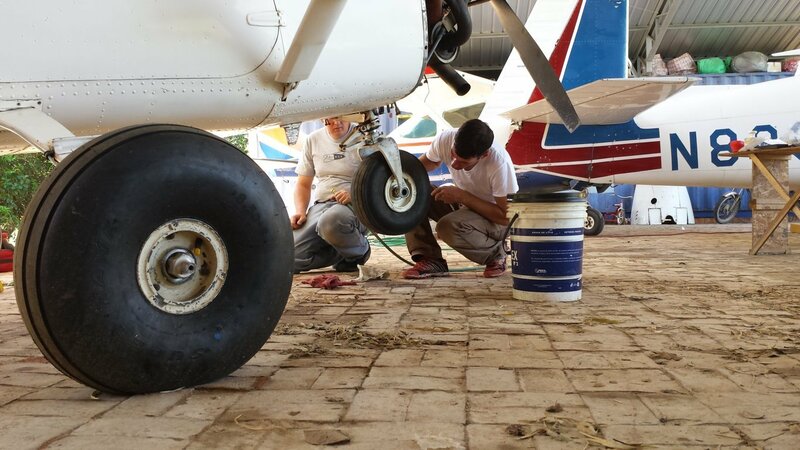 Flying our airplanes from our runway with bigger tires will make takeoffs and landing much smoother and increase the life of instruments in the airplane while providing the capability to land in the roughest of strips be it in the jungle or in the mountains. I am working on paperwork to get our first nationalized airplane, and we are close to having everything in order. We will also need funding to put a new engine and propeller on the airplane. It has been a long process to get everything to this point, but it is all in the Lord’s timing. Nationalizing the airplane also means the pilot would need to convalidate his U.S license and maintenance be done by certified repair station. All of which have their own challenges. 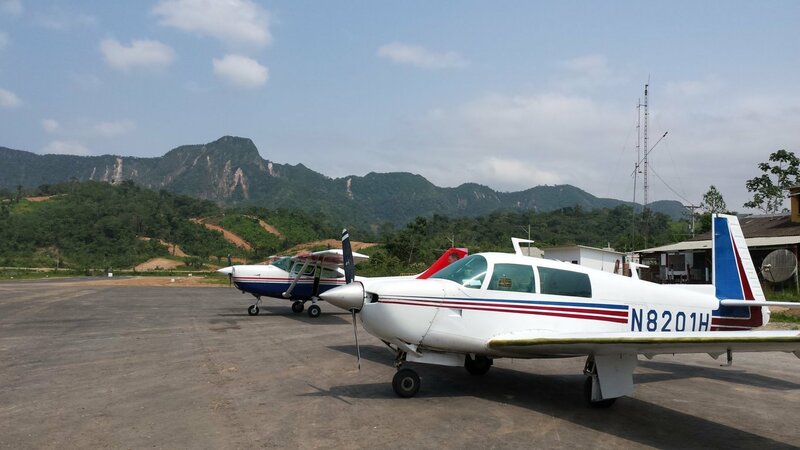 Before the end of the year, we would like to base one of our airplanes in the north of the country. We have new pilots who are ready to be trained in. As operations increase, we also see the need for more volunteers. If you would like to know how you can help, please send me an email to see where you can help us out, whether it is financially or being part of the team on the ground or in the air. 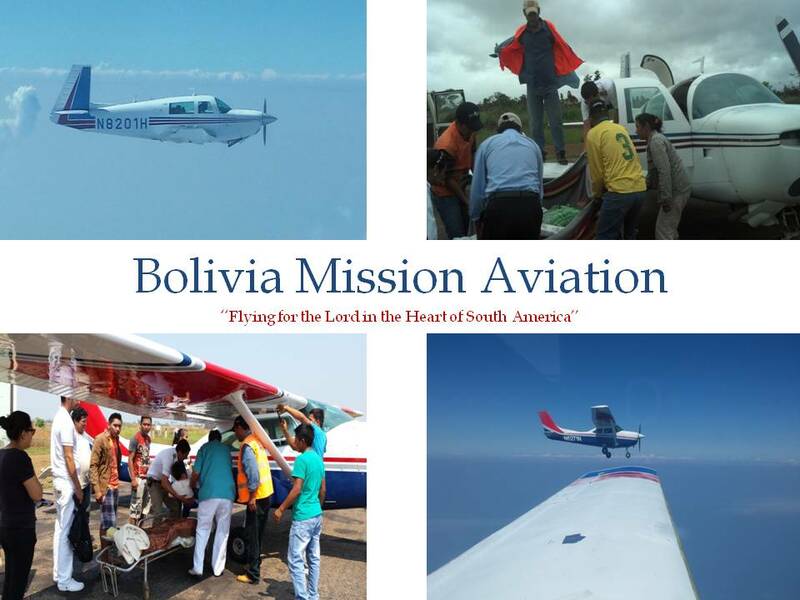 Above all, please continue to pray for Bolivia Mission Aviation, the pilots and donors who keep us going. We have gotten this far only though much prayer. We need it every day, to make the right decisions to carry the project forward to its full potential and keep the focus of reaching others though aviation. We need prayer while flying and witnessing to those who come in contact with us. Like David Gates likes to say, the important thing is to keep the main thing, the main thing! WOw!!! What a busy and fun summer! I only wish I could have seen you when you were in California! What fun it would be to meet your little girl and wife!